Why is my reaction so different now? Because “M” is about the a serial murderer of children. A city is plagued by the recurring nightmare of murdered children. Eight of them have been slain, one by one, and no one knows who the murderer is. The populace is in a panic, and neighbor turns on neighbor, friend against friend, as accusations and suspicions rise to fever pitch. The police, frustrated in their tireless efforts, turn up the heat and begin raiding known criminal haunts, casting a desperate dragnet to catch the one among the many. The plot unfolds in three intertwined stories. We have the detective who is sure that through examination of evidence in a sort of “CSI: Art Deco,” he will be able to discover the murderer’s identity. Then we have the guild of thieves which, suffering the most from the heightened police activity, decides to find the murderer themselves before they all go broke. And finally we have the story of the murderer himself (Lorre’s first major role), as he struggles with his compulsion. Lang can never be accused of subtlety, even considering the generally ham-fisted methods of his day, and this is no exception. Morals are pretty much lit up in neon, fluorescent messages for our edification, and it is no different here. 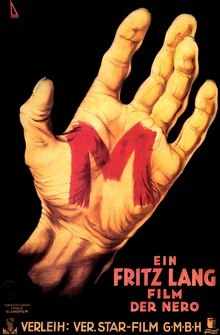 “M” has its point, and Lang makes sure it’s made, but this really doesn’t detract from the film. But watching this film, looking down the long lens of time to 1931 Germany, seeing the way the people of that day and place felt about the murder of children, I can’t help but compare it to how we, today, react to the massacre of children in Newtown, CT. To Fritz Lang, it was thoroughly conceivable that an entire city would be tearing itself apart to find the man responsible for the death of eight children, so much so that even the criminal community would organize and get involved. Today, we can barely keep the fires of indignation lit for three months after the slaughter of dozens, much less take any meaningful action. I came away from “M” glad to have seen it. It is a fascinating movie that doesn’t disappoint. But I also came away from it a little sad, though I can’t blame the film for that. “M” is a great film, all on its own, but it’s also a snapshot of an era, a time, a moral code, and a mindset that in many ways–for better or worse–is lost to us. I think that we see so much violence we just shut it out after a while. It’s less painful to “forget” about it. Yes, less painful to forget, until it happens again. There are some things we need to remember in order to effect change.